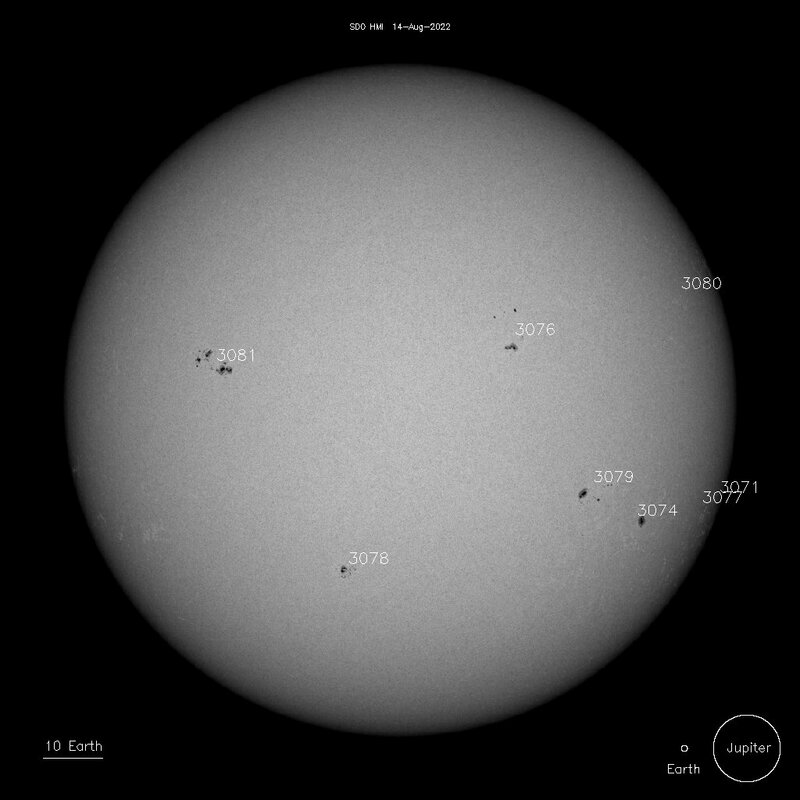 Mar 20 Equinox at 5:58 pm EDT, the Vernal Equinox for the Northern Hemisphere. Mar 20 Full Moon at 9:43 pm EDT in western Virgo. Mar 21 Informal Meeting at the Virtua Health and Wellness Center in Moorestown, NJ. Informal meetings in 2019 will continue to be on the third Thursday of the month. As always, guests are welcome and no astronomical experience is necessary. Use the Main Entrance, go straight ahead and follow the sign for the conference room, or check with the security guard who will direct you. Here are the minutes from the March 1 meeting. Apr 5 New Moon at 4:50 am EST in northern Cetus. Apr 5 Formal Meeting, 7:30 pm at the Virtua Health and Wellness Center in Moorestown, NJ. Apr 5 Private Star Watch at Kresson School. Member scope support will be needed! Apr 6 Public Star Watch at Batsto. Check back for the weather call on the day of the event. Apr 6 NEAF, the Northeast Astronomy Forum, runs April 6 & 7 at Rockland Community College, Suffern, NY. 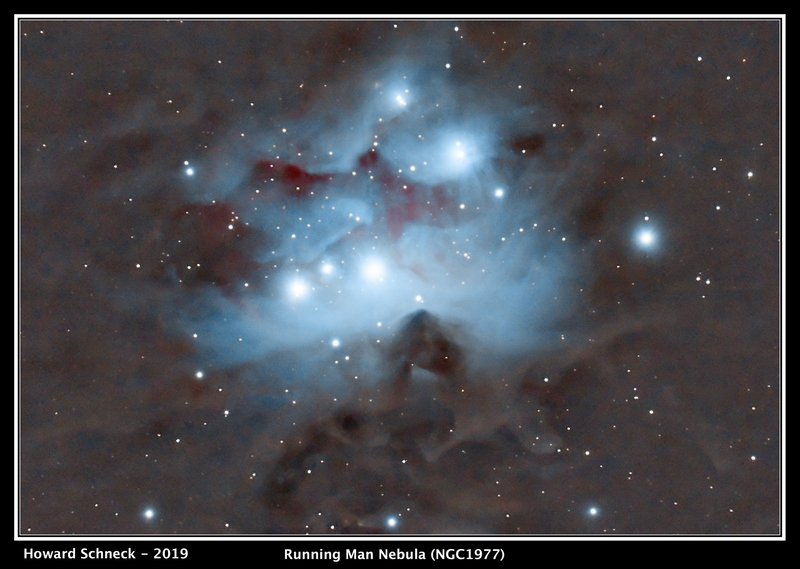 Club member Howard Schneck captured this image of NGC 1977 in the sword of Orion, just north of the famous Orion Nebula (M42). It was captured over three days, January 11, 14 and 31, 2019, from two different sites, Atsion and Mt. Laurel. It represents a total of 5.3 hr of integration time (106 x 3 minutes) with a Canon T3 digital SLR camera at the prime focus of a Celestron Edge HD8 with a 0.7x focal reducer (1490 mm focal length). The scope was tracking on a Sky-Watcher HEQ6 German equatorial mount, guided with PHD2 via an Orion 60 mm f/4 guide scope and a ZWO ASI120MM-S digital camera. For the My. Laurel images, a light pollution filter was clipped into the T3's mirror box. Post processing was done with PixInsight. Click the image for a larger version.